Get Smart! 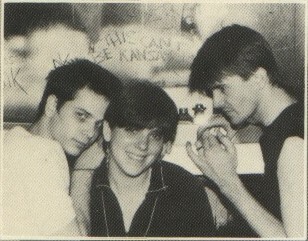 band formed while at University of Kansas in Lawrence, KS in 1980. In 1982 they relocated to Chicago, IL. The group signed to Fever Records (an independent label in Philadelphia, PA) and released their first album, "Action Reaction" in 1984. For the band's second album, Fever Records arranged a pressing and distribution deal with Enigma Records in Los Angeles, CA. "Swimming With Sharks" was released in 1986 on Enigma's "Restless Records" boutique label. The band disbanded in 1990.